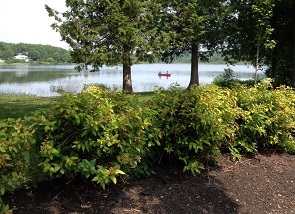 Ritchie Lake Park is a small park located on Ritchie Lake, just off Pettingill Road on (Cedar Grove Drive). It contains a unsupervised beach, a short walking trail, and has both benches and picnic tables. Ritchie Lake Beach, an unsupervised beach, is located in the centre of the Town and offers a picnic area, a beach ideal for children to wade, and a short walking trail along the bank of the lake. The public benches along the trail are a wonderful spot to stop watch the various wildlife, which inhabit the area.